Prevention and treatment of allograft rejection in organ transplant recipients relies primarily on non–antigen-specific immunosuppression, with all its associated potential hazards and costs. Currently, the status of the recipient immune response is measured by monitoring pharmacologic drug levels and clinical/pathologic evaluation of graft function. Development of reliable assays that can measure accurately the status of the immune response not only would help clinicians customize the prescription of immunosuppressive drugs in individual patients but also may allow their complete withdrawal in some patients with immunologic tolerance. 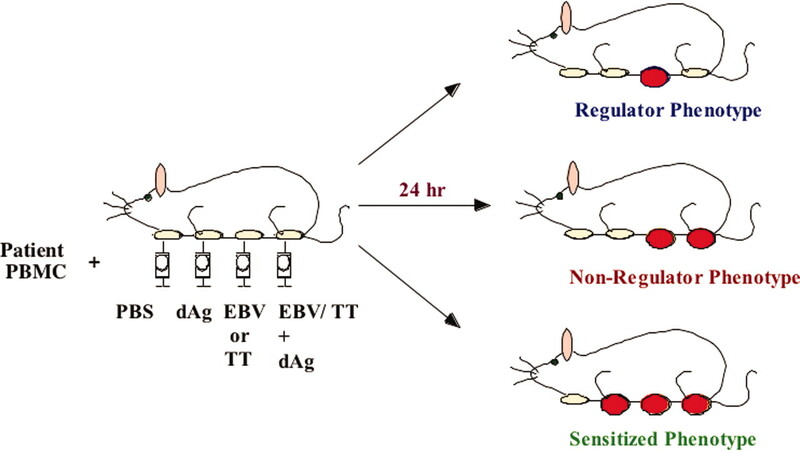 Furthermore, these assays would facilitate the safe evaluation of novel tolerogenic regimens. Achieving this goal has proved to be very difficult because it requires both a more in-depth understanding of complex mechanisms of tolerance and also identification of transplant patients with acquired tolerance to an allograft that can be studied. This review discusses the current understanding of tolerance mechanisms and outlines the unique and specific challenges in development of tolerance/monitoring assays in the field of transplantation. In addition, several of the most promising candidate assays are discussed in detail. Development of assays that allow us to monitor the current state of an immune response (rejection/tolerance) is of great interest for several reasons: First, such assays may help clinicians to move from the current era of empiric therapy to an era of more rational and individualized prescription of immunosuppressive drugs. Despite significant improvements in new immunosuppressive drugs, the long-term use of currently available medications still is associated with numerous adverse effects, such as premature graft failure, morbidity, and death (1). The survival of renal allografts has not increased to the extent predicted, mostly because of the almost universal development of chronic allograft nephropathy (CAN) (2–4). The economic costs of these medications also are a significant burden for society and individual patients and likely contribute to noncompliance. However, empiric withdrawal of immunosuppressive agents in stable patients can pose significant risks and ethical challenges (5). Therefore, development of assays that are indicative of tolerance would increase the safety of immunosuppressive drug minimization or even complete cessation of immunosuppressive agents. Second, tolerance assays would promote a better understanding of the mechanisms underlying tolerance and aid in the design of tolerance-inducing clinical transplantation trials. Last, such assays have the potential to identify rejection without resorting to invasive tests. Although biopsies are helpful for identifying the pathologic changes that are associated with rejection and/or toxicity, they are invasive and indicative only of a process that has already occurred. The implementation of protocol biopsies for early diagnosis has proved to be difficult because of the cost and potential risk to the patients. Although histologic analysis of renal allografts currently is considered to be the best predictor of rejection, recent data suggest that cellular infiltrates are not invariably associated with allograft dysfunction (6,7), and in some instances, such infiltrates may be protective because of the potential action of regulatory T cells (7). In addition, delayed treatment to reverse the process may be costly and/or unsuccessful and even if successful may have a negative impact on long-term graft function and outcome. Immunologic monitoring assays, once available, may be predictive of adverse events before their clinical manifestation and could lead to intervention at a much earlier stage, thereby avoiding the clinical and pathologic changes that are detrimental to graft function and survival. Despite the pressing need to develop tolerance assays, to date, no assays have been shown to predict accurately the development or presence of donor-specific tolerance after transplantation: Development of tolerance assays requires an in-depth understanding of the complex and rare phenomenon of tolerance. The rarity of spontaneous transplantation tolerance and the difficulty of identifying such individuals pose major challenges in studying tolerance. In addition, the mechanisms of tolerance probably are numerous, may change over time, and vary depending on the organs involved. It now has become increasingly clear that tolerance in experimental rodent transplant models may differ from clinical transplantation in humans. Finally, many promising candidate assays measure the presence of antidonor responses or proinflammatory responses ex vivo, usually in peripheral blood lymphocytes. In many cases, hyporesponsiveness as determined by these assays does not indicate tolerance. The extent to which the response in peripheral blood mirrors what happens in the tissue also is widely debated. Last but not least, ideal monitoring assays for clinical use should be noninvasive, sensitive, specific, and relatively inexpensive. Immune monitoring assays that currently are in development can be divided broadly into two major categories: Donor antigen specific and antigen nonspecific. Donor antigen–specific assays measure the response of T and B cells to specific donor antigens, whereas antigen-nonspecific assays for the most part determine the phenotype of surface markers or functional state of cells with the goal of identifying a pattern that is associated with a particular clinical status. In this review, we discuss promising candidate assays and outline the unique challenges of developing tolerance assays in human transplant recipients. For the purposes of this discussion, it is important to acknowledge that the precise definitions of transplant tolerance that are applied to experimental models cannot be applied directly to clinical transplantation tolerance. A simple definition of clinical tolerance is the maintenance of normal graft function in the absence of immunosuppression in patients who are capable of responding to commonly encountered environmental antigens. An understanding of the immunologic mechanisms that are responsible for the development and maintenance of tolerance would facilitate the development of “tolerance assays.” To that end, we review those mechanisms, which, on the basis of experimental studies and limited clinical evidence, may contribute to transplantation tolerance (Figure 1). It is important to keep in mind that these mechanisms are not mutually exclusive and that tolerance may be the result of several of these mechanisms operating simultaneously or sequentially (8). Therefore, one must view tolerance as a dynamic state, and assay development must be able to measure and monitor prospectively the state of tolerance or its loss over time. 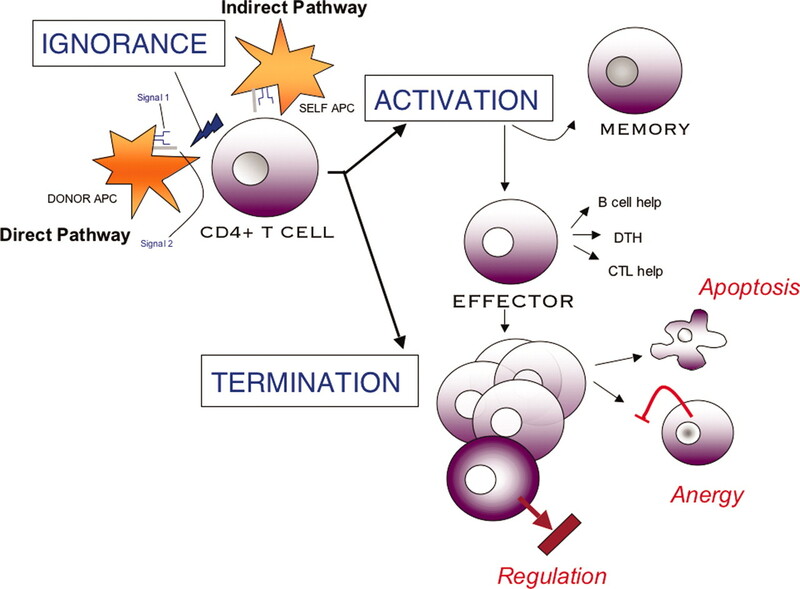 Mechanisms of acquired immune tolerance. Complete T cell activation requires the following: Antigen encounter (signal 1), engagement of certain cell surface molecules by their appropriate ligands (co-stimulatory signals [signal 2]), and occurrence of above interactions within secondary lymphoid organs. If T cells are prevented from migrating to lymphoid organs where they encounter antigen in the correct environment, then they cannot undergo full activation (ignorance). If T cells receive signal 1 but not positive signal 2 (or receive negative signal 2), then biochemical or gene expression changes that intrinsically dampen their ability to be fully activated, resulting in anergy, occur. Other cells that are activated successfully are deleted through induction of cell death or are suppressed extrinsically by regulatory T cells. For the immune system to mount a response against a foreign antigen, it must be aware of the antigen’s presence. T cell recognition of alloantigen is the central and primary event that ultimately leads to graft rejection, although several other factors also may contribute to the effector mechanisms of graft failure (9). It now is well established that T cells can recognize alloantigen via two distinct yet nonmutually exclusive, pathways. In the “direct” pathway, T cells recognize intact allo-MHC molecules on the surface of donor-derived antigen-presenting cells (APC). In the “indirect” pathway, T cells recognize processed alloantigens, particularly donor MHC antigens, presented as allopeptides by self APC. Similarly, the initiation of a productive adaptive immune response requires lymphocytes to encounter antigen in the correct microenvironment. For example, allograft rejection is impaired in mice that lack secondary lymphoid organs as a result of splenectomy and genetic mutations that affect signaling through the NF-κB pathway and thus normal development of lymph nodes (aly/aly mutant mice, lymphotoxin α and lymphotoxin β receptor knockout mice) (10,11). It is important to note that while activation of naïve T cells and consequent allograft rejection seem to require that antigen encounter occurs within the environment of secondary lymphoid organs, memory T cells can be activated effectively in the absence of secondary lymphoid organs and mediate effective allograft rejection (12). Although ignorance currently is unlikely to contribute to tolerance in the clinical setting, this mechanism may become increasingly important as new immunosuppressive agents that disrupt lymphocyte trafficking are developed. Anergy is a second mechanism that may contribute to transplantation tolerance (13). Anergy refers to a long-lasting state of partial or total unresponsiveness that develops after suboptimal or incomplete T cell activation (reviewed in reference ). Activation of naïve T cells requires a combination of T cell receptor (TCR) ligation plus a positive co-stimulatory signal (15,16). Early examples of co-stimulatory molecules that are expressed by T cells include CD28 and its ligands CD80 and CD86 and CD154 and its ligand CD40. Subsequently, a number of additional co-stimulatory molecules (4-1BB and OX40), many of which belong to the TNF receptor superfamily, have been described (reviewed in reference ). T cell anergy can result when antigen is recognized without co-stimulatory signaling. A number of inhibitory co-stimulatory molecules, such as CTLA4, which binds to CD80 and CD86, and PD-1 and its ligand PD-L, act to inhibit T cell activation and may contribute to development of anergy (reviewed in reference). T cell activation in the absence of certain cytokines (e.g., IL-2) or in the presence of other cytokines (e.g., IL-10) also may promote the development of anergy. Regardless of how lymphocytes become anergic, they persist in a functionally impaired state. Importantly, this state is reversible under certain circumstances, suggesting that transplantation tolerance that is mediated by anergy alone may not persist indefinitely. It should be noted that some but not all anergic T cells eventually will be deleted by the process of apoptosis (see below). As agents that block T cell co-stimulatory signals such as LEA29Y/Belatacept (19,20), a CTLA4-Ig fusion protein, are introduced into clinical transplantation, anergy and apoptosis may take on increasingly important roles as mechanisms of allograft acceptance. A third mechanism that contributes to allograft acceptance is active suppression or regulation. Several populations of cells including CD4+CD25+, CD3+CD4−CD8−, CD8+CD28−, and NK1.1+ T cells have been shown to be capable of regulating immune responses (reviewed in reference ). Regulatory cells have been shown to be critical for attaining transplantation tolerance in a number of experimental (reviewed in reference ) and preclinical nonhuman primate transplant models (23). Regulatory cells also have been detected in humans after organ transplantation (24) and, at least in some cases, are associated with functional tolerance (25). Expression of the transcription factor Foxp3 has been shown to confer regulatory properties on T cells. In fact, mutations in the X chromosome–encoded Foxp3 gene is the cause of the early onset fatal autoimmune disorder observed in patients with IPEX (immune dysregulation, polyendocrinopathy, enteropathy, X-linked syndrome) (26). Last, deletion of donor-reactive T cells may contribute to tolerance. As evidenced by the robust nature of neonatal tolerance, deletion is a powerful mechanism. Deletion of alloreactive T cells can occur centrally within the thymus or in peripheral tissues. Apoptosis of T cells that leads to deletion can be mediated through two distinct mechanisms. First, engagement of death receptors such as Fas, most of which belong to the TNF receptor superfamily and contain an intracellular death domain, signals via the caspase pathway, resulting in cell death. Second, withdrawal of cytokines that promote T cell survival such as IL-2, IL-4, IL-7, and IL-15 (all sharing the common γ chain) promotes T cell death by altering the activity of Bcl-2 family proteins. Several strategies that aimed to promote the death of donor-reactive recipient T cells have been devised and examined in both experimental and clinical models. As already discussed, co-stimulation blockade may cause T cells to become anergic and thereby result in allograft acceptance. However, it also is well accepted that a significant number of these anergic T cells will go on to die. Therefore, deletion may contribute to the long-term allograft survival that occurs after co-stimulation blockade. Combined bone marrow and organ transplantation in conditioned recipients who were treated with a short course of various immunosuppressants (e.g., co-stimulation blockers, cyclosporine) has been shown to promote the development of robust tolerance in a number of rodent and preclinical transplant models as well as in humans (27–30). Deletion in this model is mediated by peripheral as well as central mechanisms (31). The preceding discussion suggests the existence of several discrete mechanisms that are responsible for the acquisition of tolerance. Although each of these mechanisms has been demonstrated to be operative in reductionist experimental transplant models, it is increasingly recognized that tolerance after transplantation in humans is likely to result from several of these mechanisms occurring simultaneously or sequentially. It seems likely that numerous assays that aim to detect different pro-tolerance mechanisms will be necessary. Furthermore, recipients will need to be studied serially because the mechanisms that lead to and sustain tolerance may change over time. In addition to considering those mechanisms that may contribute to tolerance, a brief mention of three factors that may inhibit the development of tolerance and confound the interpretation of tolerance assays is warranted. Memory T cells, by virtue of their less stringent requirements for activation, more mature effector functions, and broader trafficking to peripheral tissues, present a barrier to tolerance. Although alloreactive memory cells clearly do not respond to therapies that effectively inhibit rejection that is mediated by naïve T cells (32), an equally significant problem is posed by memory T cells that initially are primed by environmental antigens that cross-react with antigens that are expressed by the transplanted organ. This concept of heterologous immunity first was reported by Lombardi et al. (33), who demonstrated that both naïve and memory cells that were primed against Candida albicans responded to allogeneic MHC antigens in vitro. It was shown subsequently that memory cells that are generated in response to viral infections can impair allograft acceptance or the development of tolerance (34,35). Second, the effects of immunosuppressive drugs on the development of tolerance also need to be considered because some drugs, such as calcineurin inhibitors, have been suggested to inhibit the development of tolerance (36), whereas others, such as rapamycin, may promote the development of regulatory T cells (37). Last but not least, induction of transplantation tolerance may be prohibited by factors such as infection and ischemia-reperfusion injury that lead to the activation of innate immune system (38). The development of immunologic memory and antigen specificity are hallmarks of the adaptive immune system. Strict definitions of transplantation tolerance include impaired responses to donor antigens with maintenance of immune responsiveness to third-party and nondonor antigens. Therefore, assays that evaluate donor-specific responses of recipient lymphocytes are likely to be informative in transplantation. In this regard, one important point is that over time after organ transplantation, T cells may recognize different epitopes of donor antigens in the same individuals, a process called epitope spreading. This phenomenon has been described in renal (39), cardiac (40), and lung transplant recipients (41). This process has been implicated as a mechanism for continual recruitment of naïve alloreactive T cells, which may contribute toward acute and chronic rejection. Clearly, epitope spreading needs to be kept in mind in development and interpretation of antigen-specific monitoring/tolerance assays in transplantation. Traditional assays of T cell reactivity that reflect antigen-specific responses include the mixed leukocyte reaction (MLR), the cytotoxic T lymphocyte (CTL) assay, the ELISA, and the limiting dilution assay. With the exception of the CTL assay (see below), the results of these assays have not been shown consistently to be correlated with the development of tolerance or the ability to wean immunosuppression. CTL assay quantifies the cytolytic activity of recipient T cells primed in vivo after transplantation. Specifically, recipient T cells are cultured with Cr51-labeled target cells that express donor or irrelevant alloantigens for a short period, and lysis is determined by measurement of the amount of Cr51 released. In an early report that described a patient who displayed functional tolerance after kidney transplantation, Burlingham et al. (42) reported hyporesponsiveness to donor alloantigens in a CTL assay. More recently, Weimer et al. (43) reported using hyporesponsiveness in the CTL assays to guide drug withdrawal after renal transplantation. These data suggest that measures of the donor-specific cytotoxicity of recipient T cells after transplantation may be useful for guiding decisions about immunosuppressive drug management and for the identification of tolerant transplant recipients. Nevertheless, the assay typically assesses CD8+ T cell–mediated activity only and does not give a comprehensive picture of alloreactivity. The following discussion focuses on summarizing experience with promising new T cell assays (Table 1) such as the enzyme-linked immunospot (ELISPOT) assay, the transvivo delayed-type hypersensitivity (DTH) assay, Tetramer technology, assays based on flow cytometry (carboxy-fluorescein diacetate succinimidyl ester [CFSE], and intracellular cytokines), and currently available anti-donor B cell assays. ELISPOT assay is a hybrid that combines features of a MLR and an ELISA assay in that responder/recipient T cells are cultured with inactivated stimulator/donor or third-party cells in tissue culture plates that are coated with an antibody that is specific for the cytokine of interest (many cytokines have been studied, including IFN-γ, IL-2, IL-4, IL-5, and IL-10; Figure 2). After a fairly brief culture period, the cells are washed away and the bound cytokine is detected, using labeled secondary antibodies and an automated plate reader. Because of the short culture period, each spot that is detected represents a cell that had been primed to the stimulating antigen(s) in vivo (effector or memory T cells). Thus, this assay measures the frequency of previously activated or memory T cells that respond to donor antigens by producing a selected cytokine rather than the total amount of cytokine that is produced and secreted into supernatants (as measured using an ELISA). This is an important advantage because cytokines are captured immediately upon secretion from cells, whereas cytokines that are secreted in supernatants may be subject to breakdown or dilution or may be used up by other cells. Another unique feature of this assay is that it is capable of distinguishing between recipient T cells that are responding to donor antigens that are presented via either the direct or the indirect pathways of antigen presentation. For detection of directly presented donor antigens, recipient T cells are cultured with whole, inactivated donor cells. For detection of recipient T cells that are responding to indirectly presented donor antigens, recipient T cells are cultured with recipient APC plus donor proteins in the form of cell lysates or peptides (44). Distinguishing between these two pathways of antigen presentation may be important because early antidonor responses after transplantation tend to be dominated by direct responses, whereas late responses tend to occur more frequently via the indirect pathway. Another advantage of the assay is that it may determine the mechanisms that are responsible for an absent response in some transplant patients by uncovering regulation (24). A recent publication that used the ELISPOT assay to compare whole peripheral blood leukocytes or CD25-depleted peripheral blood leukocytes in stable renal transplant patients (thus hyporeactive to donor antigens) demonstrated evidence of regulation in half of studied individuals (24). In addition, the assay has been optimized for use of frozen cells that can be easily stored. Although no studies to date have reported the use of this assay to identify functionally tolerant humans after transplantation, the frequency of IFN-γ–producing cells has been reported to correlate with the incidence of acute and chronic rejection as well as allograft function after renal transplantation (45–47). Obtaining and storing sufficient numbers of donor cells to perform the assay repeatedly is a practical limitation, particularly in recipients of deceased-donor organs. Nevertheless, on the basis of these promising results in small cross-sectional studies, large, multicenter, prospective studies that also include “tolerant” patients are under way to evaluate the ability of this assay to predict rejection and tolerance in kidney transplant recipients. 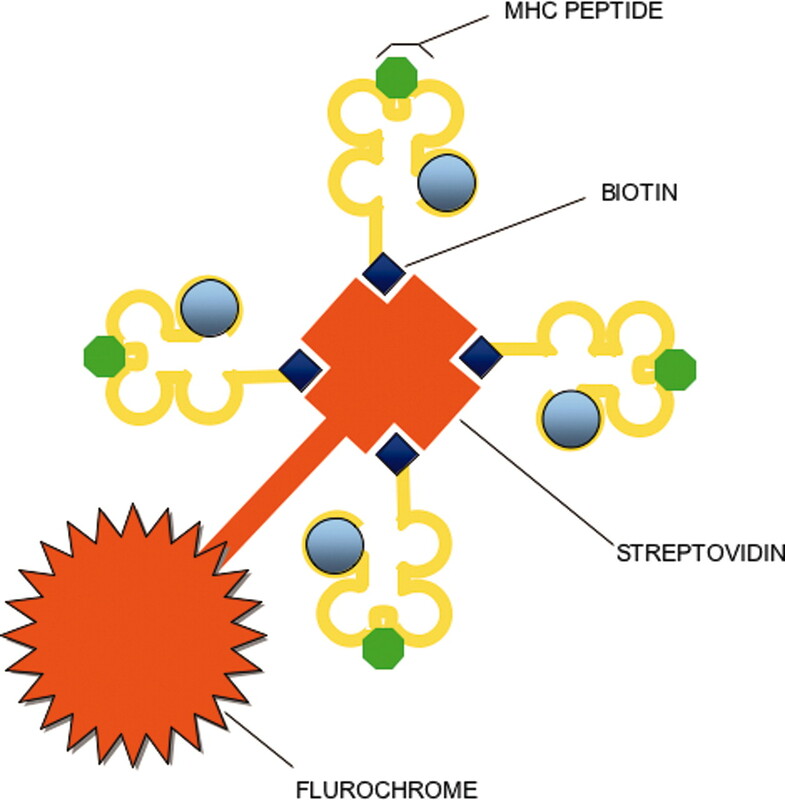 Illustration of the basic principles of the enzyme-linked immunospot (ELISPOT) assay: Cells are incubated in plates that are coated by a capture antibody against the cytokine of interest for a short period of time. Once the cytokine exits the cell membrane, it is captured right away by the capture antibody. The cells then are washed away, and the bound cytokine is detected using labeled secondary antibodies against a different epitope of the same cytokine. Each spot represents the cytokine footprint of a single cell. Cells that are isolated from patients after transplantation are injected into the footpads or ears of immunodeficient mice together with donor antigen (Figure 3). Recipient cells that respond to donor antigen produce a DTH reaction that is quantified by measuring the resultant swelling with a caliper. Saline, third-party allogeneic cells, and recall antigens such as tetanus or Epstein-Barr virus can be injected as controls. The absence of a DTH response when donor and recipient cells are injected at a single site could represent the failure of recipient T cells to be primed in vivo in response to donor antigens or could be the result of an active regulatory mechanism that inhibits the antidonor response (Figure 3). For distinguishing between these two possibilities, recipient T cells can be injected together with both donor antigen and recall antigens. The loss of a DTH response to recall antigens in this setting could be attributed to bystander suppression that is mediated by donor-reactive regulatory T cells. That this indeed is the case has been demonstrated by the recovery of DTH responses to donor antigen or donor antigen/recall antigen combinations after the injection of neutralizing antibodies to TGF-β and/or IL-10. Like the ELISPOT assay, recipient T cells can be exposed to donor antigen in the form of whole, inactivated cells or donor proteins plus recipient APC, thereby allowing the detection of recipient T cells that are primed by either the direct or the indirect pathways of antigen presentation. In addition, it has the potential to distinguish between deletional tolerance and tolerance that is maintained by regulation. Of the assays discussed thus far, this is the only assay to have been used to examine tolerant transplant recipients. A study of three functionally tolerant transplant recipients demonstrated that all three had intact DTH responses to third-party stimulator cells but absent DTH responses to donor antigens (25). These absent antidonor responses were restored by the injection of neutralizing antibodies to TGF-β or IL-10, suggesting the presence of active regulatory mechanisms. In contrast, one patient, who after several years of apparent tolerance was no longer tolerant, displayed a strong antidonor DTH response. This “regulator” pattern subsequently was demonstrated also to be present in nonhuman primates that displayed tolerance after kidney transplantation (23). In contrast to these findings, another group failed to find an association between antidonor responses as detected using the transvivo DTH assay and measures of outcome after kidney or pancreas transplantation for patients who still were taking immunosuppressive drugs (48). On the surface, the results of these studies suggest that the transvivo DTH assay may be more useful for detecting patients with established tolerance than for making predictions about which patients who still are receiving immunosuppressive drugs may develop tolerance in the future. However, it should be noted that these two groups used different methods to perform the assay and that these differences may explain the seemingly conflicting results. A recent study by Burlingham and colleagues (49) demonstrated that a regulated DTH response is more common among well-matched donor/recipient pairs. Taken together, these results suggest that the transvivo DTH may be useful as a tool for identifying tolerant transplant recipients. However, because of the need for mice and that the assay is relatively cumbersome, the utility of this assay for routine clinical immune monitoring is uncertain. Nevertheless, this assay also is being evaluated in larger, multicenter trials and may be helpful mainly as a research tool. Illustration of the experimental setup and interpretation of the transvivo delayed-type hypersensitivity (DTH) assay. Cells that are isolated from patients after transplantation are injected into the footpads of immune-deficient mice together with donor antigen. Recipient cells that respond to donor antigen produce a DTH reaction (sensitized phenotype). The absence of a DTH response when donor and recipient cells are injected at a single site could represent the lack of priming in vivo (nonregulator phenotype) or could be the result of an active regulatory mechanism that inhibits the antidonor response (regulator phenotype). To distinguish between these two possibilities, recipient T cells can be injected together with both donor antigen and recall antigens. The loss of a DTH response to recall antigens in this setting could be attributed to bystander suppression that is mediated by donor-reactive regulatory T cells (regulator phenotype). PBMC, peripheral blood mononuclear cells; dAg, donor antigen; EBV, Epstein-Barr virus; TT, tetanus toxin. Tetramers consist of four MHC-peptide complexes that are linked covalently to a fluorochrome (Figure 4). Such multimeric peptide-MHC complexes can bind to the TCR of T cells that are specific for the peptide-MHC molecule complex (50). The major potential of MHC tetramers is the direct visualization of antigen-specific T cells in vivo regardless of their function or ability to produce cytokines (thereby avoiding the need for a secondary in vitro stimulation) and the possibility of monitoring peptide-specific T cells over time with very small volumes of blood. The major disadvantages include the potential need for a large number of peptide-MHC tetramers to study multiple transplant antigens that additionally may undergo epitope spreading over time (see above). Another issue is that currently available tetramers are to a large extent class I tetramers that are suitable for tracking mainly CD8+ T cells. Nevertheless, MHC tetramers were used recently to monitor minor-histocompatibility antigen-specific T cells in bone marrow recipients (51) and may have the potential for monitoring multiple autoimmune diseases (50). Recent technological improvements in the design of class II tetramers should allow the identification of anti-donor CD4+ T cells in the near future. Principles of tetramer staining. Purified class I/II MHC molecule-peptide complexes are enzymatically biotinylated. The complex then is multimerized by mixing the biotinylated protein with fluorochrome-labeled streptavidin at specific molar ratios. Multimeric peptide-MHC complexes are able to bind more than one T cell receptor on a specific T cell and thus have slower dissociation rates, which allow their identification by flow cytometry of T cell specificity for the peptide-MHC molecular complex. This assay measures the proliferative response of recipient lymphocytes that are cultured or stimulated with inactivated donor cells for a period of several days. Traditionally, proliferation has been quantified by measurement of the incorporation of H3-thymidine by newly dividing cells. More recently, flow cytometry has been used to measure the dilution of the dye CFSE that segregates equally between daughter cells with each cell doubling. This approach offers several advantages, including the avoidance of radioisotopes, the ability to determine whether all cells undergo a few divisions or some cells undergo many divisions, and the ability to characterize the phenotype of the dividing cells using multicolor flow cytometric techniques. CFSE labeling to assess alloantigen responses has been used widely in murine systems (52). CFSE-MLR assay was used recently in a single human study of living-donor liver transplant recipients to distinguish rejection on suspicious biopsies (53). Despite the theoretic appeal of this assay, to date, no human studies have demonstrated a correlation between donor antigen–induced proliferation and the ability to wean immunosuppression or the development of tolerance. Another assay with potential application in transplant immune monitoring is the measurement of intracellular cytokines by flow cytometry (54). This method allows the individual characterization of a large number of cells. With multiparametric staining, it can demonstrate coexpression of different cytokines in individual cells. However, this assay involves specific activation procedures and use of inhibitors of intracellular transport, which can limit the viability of the cells. Another issue is the limited sensitivity of the assay. Assays of Antidonor B Cell Responses. Currently, the most widely applied method for determining the presence of donor-reactive B cells is the quantification of donor-specific antibodies. This approach most commonly is applied before transplantation and is referred to as a cross-match. Initially, the assay was performed by incubating donor cells together with recipient sera, anti-human globulin, and complement. If donor-specific antibodies are present, then they will fix complement and result in lysis of the donor targets. When performed as described, this assay is referred to as an AHG-CDC cross-match. Recently, techniques that make use of purified, known MHC molecules that are bound to microbeads or to plastic plates that are potentially more sensitive and specific have been introduced (55). Antidonor antibodies that bind these purified HLA molecules can be detected by flow cytometry, ELISA, or Luminex technology. This approach offers the advantage of confirming that antidonor antibodies are directed against donor MHC molecules. As recipient antibodies that are directed against non-HLA antigens that are expressed by donor cells generally are believed to be of lesser importance, this may be a significant advantage of the newer techniques. Initially, studies that examined the role of antidonor HLA-specific antibodies on outcomes of renal transplantation focused primarily on the pretransplantation setting with the aim of avoiding hyperacute or early antibody-mediated rejection. However, it also is clear that the de novo development of antidonor HLA antibodies after transplantation has deleterious effects on renal allograft survival (56). Given this correlation, efforts to develop methods to inhibit or reverse the formation of new donor-specific antibodies after transplantation are likely to be informative and important. However, permanent removal of antidonor antibodies has proved difficult in the pretransplantation setting. Conceptually, it makes sense to try to detect B cell priming to donor antigens before generating a fully developed antibody response, because plasma cells are relatively resistant to elimination by currently available reagents. Toward this aim, an assay that quantifies the precursor frequency of B cells that secrete antibodies that are specific for donor HLA molecules was described (57). The utility of this approach for immune monitoring and as a basis for interventions that aim to reduce antidonor antibodies remains largely unexplored. Generation of a Renewable Source of Donor Antigen. Although donor specificity is a major strength of each assay described here, repetitive monitoring of antidonor responses using these assays requires that a significant number of donor cells be available over an extended period of time. A technique to generate and sustain donor cells for use in monitoring assays after transplantation was described recently (58). Purified CD19+ B cells are stimulated in culture with CD40L-transfected NIH-3T3 cells. The stimulated cells express high levels of MHC class I and class II as well as the co-stimulatory molecules CD80 and CD86. These cells effectively promoted anti-HLA T and B cell responses when used as stimulators for flow cross-matching, CFSE-MLR, and IFN-γ ELISPOT assays. A number of non–antigen-specific assays that may be useful for posttransplantation monitoring of the recipient immune response also have been described. Such assays include phenotyping of recipient cells, characterization of the TCR repertoire with the aim of detecting perturbations from the pretransplantation state, quantifying the response of recipient T cells to polyclonal stimulation in vitro, gene expression profiling, and finally use of proteomic technologies. Analysis of gene polymorphisms also may help to correlate certain immune response gene polymorphisms with clinical behavior. Because these differences are fixed and therefore are not likely to be used for immune monitoring but rather for the prediction of risk, it is not discussed further. Regulatory cells have been shown to be important for controlling immune responses in a number of pathogenic disease processes as well as after transplantation. Several types of regulatory cells have been identified on the basis of their phenotypes, including CD4+CD25high, CD3+CD4−CD8−, CD8+CD28−, and NK1.1+ T cells. Consistent with a role for regulatory cells in transplantation tolerance, an increased frequency of CD4+CD25high T cells in the peripheral blood was observed in tolerant children after living-donor liver transplantation (59). A second population of regulatory cells that express the CD8+CD28− phenotype also has been reported to be associated with lower rates of rejection and an increased likelihood of being weaned effectively from immunosuppression in kidney and liver transplant recipients (60). Although quantification and characterization of regulatory T cells has the potential to identify patients with predilection toward “tolerance,” no systematic studies have been performed to date. The interpretation of data may be complicated by recent data suggesting that regulatory T cells not only may play a preventive role by maintaining hyporesponsiveness to allograft and preventing rejection in stable/tolerant patients but also may play an important role in controlling the damage in the allografts during the rejection process itself (7). In addition, different dendritic cell (DC) subsets have been shown to have different functional properties. Thus, quantification and characterization of these cells by flow cytometry may be useful in identifying tolerant patients versus patients with predilection to rejection. Flow cytometric analysis of peripheral blood cells revealed an increase in the frequency of plasmacytoid DC precursors in tolerant liver transplant recipients relative to those who required continued immunosuppression (61). Plasmacytoid DC have been reported to promote Th2-type responses and, in some settings, be associated with the development of tolerance. The relative frequency of plasmacytoid and monocytoid DC precursors (pDC2 and pDC1, respectively) was not affected directly by the administration of immunosuppressive drugs. Therefore, changes in the relative numbers of pDC2 and pDC1 reflect changes in the recipient immune system that favor tolerance rather than simply reflect exposure to immunosuppressive drugs (62). Given the lack of donor specificity, longitudinal studies are required to ensure that alterations in the balance of DC reflect transplantation tolerance rather than other conditions, such as immunodeficiency. It has been hypothesized that the T cell component of the immune response to numerous self and foreign antigens is dominated by T cells using a limited number of TCR. This suggests a perturbation in the T cell repertoire that potentially could be measured. TcLandscape is one method for characterizing changes in the TCR repertoire (63). Briefly, this assay uses quantitative PCR, gel electrophoresis, and DNA sequencing to determine the proportion of T cells that use each of the Vβ chains and to determine the CDR3 length distributions of each Vβ gene product. Perturbations from the normal Gaussian distribution of CDR3 lengths for any given Vβ chain would indicate expansion or contraction of that part of the T cell repertoire. The data are displayed as a three-dimensional landscape with the x axis indicating the Vβ chain used, the y axis indicating the CDR3 length, and the z axis indicating the amount of mRNA encoding the TCR using a given Vβ/CDR3 length. Overexpressed TCR would represent T cell subsets that are expanded in response to donor antigens, whereas underexpressed TCR would represent subsets of T cells that have been deleted at least partially from the repertoire. Depending on the patient’s clinical status, overrepresented TCR could indicate the expansion of alloreactive T cells that are capable of mediating allograft rejection or the expansion of protective regulatory T cells. Using this assay, the peripheral blood T cells of tolerant recipients of renal allografts or recipients who are maintained on low-dosage corticosteroid monotherapy have been reported to display significant clonal perturbations in their T cell repertoire relative to stable patients who receive conventional immunosuppression, patients with CAN, and normal healthy volunteers (64). One major issue with this method is lack of donor specificity. This may affect the interpretation of the results as other antigens such as viral infections are likely to influence the T cell repertoire. Thus, longitudinal studies are needed to determine the stability of the repertoire changes described. Although assays of T cell activation in response to allogeneic donor MHC molecules represent the ideal, the complex nature of some of these assays together with the problems that are related to the availability of donor cells have led to the development of an assay that quantifies the maximal degree to which recipient T cells can be activated by an non–donor-specific, polyclonal stimulus. This assay is marketed commercially as ImmunKnow—the Cylex Immune Cell Function Assay. On the basis of a multicenter study, this assay was approved by the Food and Drug Administration for monitoring cell-mediated immunity in immunosuppressed patients (65). This assay is performed by stimulating whole blood (i.e., lymphocytes in the presence of circulating levels of immunosuppressive drugs) with phytohemagglutinin for 12 to 15 h. CD4+ T cells are isolated by magnetic bead selection. The extent of early CD4+ T cell activation is reflected by the synthesis and accumulation of intracellular ATP that is measured after cell lysis. This assay was designed to reflect the global or net state of immunosuppression and thereby facilitate decisions related to dosing immunosuppressive drugs after transplantation. To date, only a single report has described the clinical use of this assay for managing immunosuppression after transplantation (66). The broader clinical application of this assay likely will require greater experience in the setting of immunosuppressive drug weaning and tolerance. Extensive studies that have been conducted using animal transplant models have used PCR analysis of gene expression to reveal associations between the expression of certain genes and the nature of the recipient antidonor immune response. In addition to identifying potential molecular markers of immunologically mediated allograft damage, the results of these studies have provided insights into the mechanisms of allograft damage. In humans, real-time PCR analysis of the genes that are expressed by renal tubular epithelial cells that are shed in the urine demonstrated that cellular rejection was associated with increased expression of the cytotoxic proteins perforin and granzyme B, supporting the use of this approach for the noninvasive diagnosis of acute rejection (67). Recently, the measurement of FOXP3 mRNA in urine was reported to correlate with the outcome of acute rejection after renal transplantation, with increased expression of FOXP3 associated with a greater likelihood of reversal and improved graft survival (7). Most studies of this type have examined the role of a limited number of individual genes that are thought to be important in the rejection process. Advances in technology now allow the simultaneous analysis of thousands of genes. Because each cause of allograft dysfunction is likely to be mediated by numerous mechanisms, each potentially associated with concordant expression and co-regulation of multiple genes, the analysis of patterns of gene expression may be more sensitive and specific. This approach also may suggest new mechanisms of allograft injury that are not revealed by traditional hypothesis-driven approaches. The use of microarrays in transplantation together with a helpful discussion of the methods, strengths, and limitation of this technology was reviewed recently (68). It is hoped that these assays can lead to the construction of disease/tolerance-specific “molecular fingerprinting” models (69). The basic concept of DNA microarrays is as follows: mRNA is reverse-transcribed into cDNA, labeled with a fluorescent dye, and hybridized to the array. After any unbound sample is washed away, the array is scanned. The fluorescence intensity at a specific spot represents an individual gene that correlates directly with the abundance of this gene in the sample. Microarray analysis of samples that were obtained from renal transplant recipients demonstrated distinct patterns of gene expression, or signatures, that distinguished from among normal kidney donors, recipients who were free from rejection and had good graft function, recipients with acute rejection, and recipients with impaired graft function as a result of causes other than rejection (70). Importantly, similar patterns were observed in both allograft tissue and peripheral blood cells, indicating the potential of this approach as a noninvasive method for assessing renal allografts. Subsequently, this group reported that microarray analysis of renal allograft biopsy specimens demonstrated differences between patients who were maintained on a mammalian target of rapamycin inhibitor and those who were maintained on a calcineurin inhibitor in the expression of genes that contribute to the progression of CAN (71). Unfortunately, genetic data sets that are obtained by this method usually are highly complex and require novel methods and software tools to handle the large volume of data generated. The assignment of biologic function to the new genes requires other biologic methods, such as proteomic analysis (see next). To date, the patterns of gene expression that are displayed by tolerant transplant recipients are not well described. As new methods for data analysis and interpretation that facilitate the management of these large data sets are developed, this technique almost certainly will be applied with increasing frequency to the study and the treatment of transplant recipients. In addition, because the measured amount of a gene that is expressed by one cell type will be affected by the frequency of that cell, analyzing gene expression for selected populations of cells would allow a more meaningful comparison between patients over time. Several proteins can be generated from a single gene, depending on how the genetic information is read (transcribed) and how the resultant protein is modified after translation (posttranslational modification) (72). Analysis of mRNA expression alone therefore is insufficient to determine whether the proteins encoded are really synthesized. Thus, the proteomic approach can complement nicely the gene expression findings. Protein microarrays are capable of providing a high-throughput approach to quantify both the amount of protein present and the function of individual proteins. However, protein arrays are subject to a number of challenges that are not encountered in designing DNA arrays. First, proteins may undergo posttranslational modification or require multimerization to function normally. Furthermore, proteins can not be amplified as can RNA, and they tend to be unstable. Because of these difficulties and others, protein microarray technology has not yet been applied to the study of transplantation. However, a number of investigators have applied protein microarrays to the study of cancer immunobiology, suggesting that in the future, protein arrays will provide important insights into the regulation of the immune response to transplanted organs. Two basic types of microarrays have been developed: Abundance-based microarrays and function-based microarrays. Because a comprehensive description of these assays is beyond the scope of this review, interested readers are referred to a recent article that provides a detailed description of these assays (73). As an alternative approach, mass spectrometry has been used to quantify the amount of protein that is present in the urine after renal transplantation (74). Individual proteins are identified by their mass-to-charge ratio. Rather than examine shed cells as is the case for urinary studies that use PCR, this assay quantifies soluble protein. Using this approach, unique patterns of protein expression that distinguish between acute cellular rejection and other causes of allograft dysfunction, such as acute tubular necrosis, urinary tract infections, glomerulopathies, and cytomegalovirus infections, have been defined. Currently, this assay is useful only in kidney transplant recipients and has not been used to study tolerant patients. In addition, because proteins that are detected in urine are the result of an active process, transplantation tolerance will be associated with a unique protein signature only when tolerance is the result of an active process. The safe and successful clinical application of tolerance-inducing strategies in patients after transplantation will depend on identifying assays that can detect and even predict the development or loss of tolerance (75). However, we face several major challenges as we try to identify tolerance assays. The foremost among them is our incomplete understanding of the mechanisms that are responsible for acquired tolerance. Given the complexity and the redundancy of the immune system, multiple mechanisms may contribute to tolerance, and these mechanisms may change over time and differ depending on the tissues involved. Therefore, it is likely that a battery of tests are needed to define the phenotype of tolerance and/or its absence. In addition, monitoring assays need to be performed over time to ensure that tolerance is not lost. One promising approach consists of development and refinement of sensitive and specific assays that give a broad picture of T cell and humoral alloreactivity after transplantation. Another is identification of gene-expression patterns that are linked to disease pathophysiology, followed by validation of candidate genes through proteomic approaches. To determine which combination of assays predicts tolerance will require the design of clinical trials that specifically aim to test multiple types of assays serially in recipients of various organs (76). Fortunately, this need has been recognized, and a number of trials sponsored by the Immune Tolerance Network (www.immunetolerance.org) and the National Institutes of Health include significant components that focus on immune monitoring after kidney, liver, heart, lung, and islet transplantation. The Registry of Tolerant Renal Transplant Recipients, sponsored by the Immune Tolerance Network, attempts to identify tolerant kidney transplant recipients and prospectively assess their immune responses using the described assays. It is hoped that such studies will help us to determine the fingerprint of tolerance. N.N. is a recipient of the American Society of Nephrology John Merrill Transplant Scholar Grant and the American Heart Association Scientist Development Grant. N.N. and K.A.N. are funded investigators of the National Institutes of Health Immune Tolerance Network. See the related editorial, “Immunosuppression and Regulation: Cast in a New Light,” on pages 2644–2646. You are going to email the following How Can We Measure Immunologic Tolerance in Humans?